As you might have read on your Twitter updates, famous American author John Updike has died today at the age of 76. I would like to eulogize him in my own manner, but nothing will compare to the official New York Times obituary. Their posthumous depictions of famous lives have guided me through a lot of otherwise dark periods. Please read the following two excerpts of Updike's work and try to understand why - on this day of his death - America will mourn an author who wrote fiction but lived a nonfiction life. The following satire appeared in the September 1974 issue of the New Yorker. Susan Sontag writes as "Desperate" and John Updike writes as "Tech Support." In addition, Husband 1.0 uninstalled many other valuable programs, such as Romance 9.5 and Personal Attention 6.5 and then installed undesirable programs such as NBA 5.0, NFL 3.0 and Golf 4.1. But remember, overuse of the above application can cause Husband 1.0 to default to Grumpy Silence 2.5, Happy Hour 7.0 or Beer 6.1. Please note that Beer 6.1 is a very bad program that will download the Snoring Loudly Beta. Whatever you do, DO NOT install Mother- In-Law 1.0 (it runs a virus in the background that will eventually seize control of all your system resources). Also do not attempt to reinstall Boyfriend 5.0 program. These are unsupported applications and will crash Husband 1.0. The most glossed over the portion of Updike's Career where he moonlit in the advertising world. After the disappointment of Bech Is Back (1982) and before the wild success of The Witches of Eastwick (1984), Updike was stuck in a literary stasis. He couldn't write novels but didn't want to write anything else. 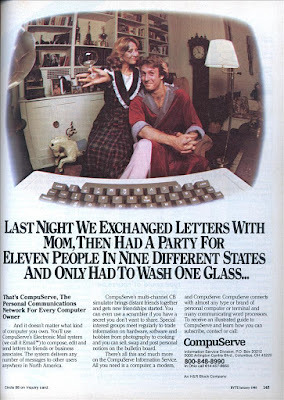 Low and behold, CompuServe approached him at just the write moment. Pun intended, deliberate, slow and unnerving as the lung cancer that killed this man today. Feel free to post your favorite Updike memories in the comments section, and don't forget to read the NYT obituary. I'm not very familiar with the work of Updike. I've read about half of one of his books and have seen about 25 minutes of Witches of Eastwick. I'm not too taken aback by his death, as I had assumed that he was already dead. I was taken to see the Witches of Eastwick and had to leave because I was too scared. I didn't even know he had said this when I wrote the post. How true it turned out to be. John Updike's short stories are among my favorites. He was always great on Charlie Rose too. He kneels to comply. Annoyed at such ready compliance, which implies pleasure, she stiffens her feet and kicks so her toenails stab his cheek, dangerously near his eyes.He pins her ankles to continue his kissing. Slightly doughy, matronly ankles.